Will Joey Votto be Canada’s last baseball MVP? I am thrilled that Cincinnati Reds’ superstar – and Canadian – Joey Votto is the near-unanimous National League MVP for 2010. Reds' Canadian superstar Joey Votto is the NL MVP - but how many Canadians will follow in his footsteps? But it also makes me a little sad. Sad because baseball interest in Canada is on the decline. It has been for several years. I understand that it’s a slow game and in a how-could-I-possibly-not-text-while-I’m-driving world, it doesn’t mesh with the pace of society. I don’t care. It’s an absolutely wonderful game. It’s the most tactical sport anywhere. And, if we’re not careful, Canadian guys like Joey Votto will cease to exist. 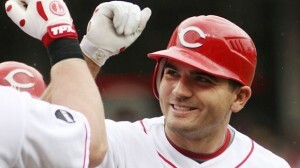 Joey Votto was born in Etobicoke (suburb of Toronto) in 1983. When the Toronto Blue Jays were exploding to two World Series titles, Votto was the perfect age to take in all the excitement. All of Canada was into the Jays then. You could not walk down the street in Toronto without seeing a Jack Morris jersey or a Jays’ cap. But (little did we know) that the decline of Canadian baseball interest was lurking just around the corner. 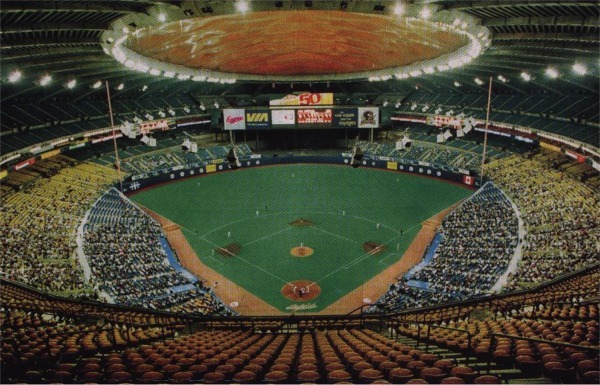 In 1969, the Montréal Expos became Canada’s first major league club. The Jays followed in 1977. In 1981, the Expos came within a Rick Monday home run of becoming the first Canadian team in the World Series. In the early 1980s, the AAA Pacific Coast League infiltrated Vancouver (Canadians), Edmonton (Trappers) and Calgary (Cannons). Fans in those three Western Canadian cities – thanks to owners like Russ Parker and Peter Pocklington – got to see great baseball. Mark McGwire and Jose Canseco came into town with their Tacoma Tigers. The Trappers won PCL championships in 1984, ’96, ’97 and 2002. The Vancouver Canadians took the league title in 1985 and ’89. It was exciting. In the mid-1980s, part of my job was to produce PCL games for local Alberta TV stations. I saw the growth first-hand. Players like Wally Joyner, Devon White, Ron Kittle and Danny Tartabull all played in Alberta. 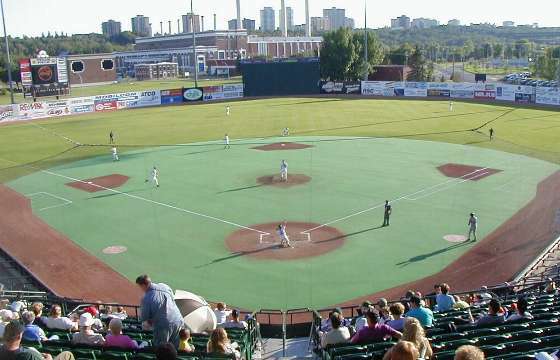 Edmonton even tore down their stadium (John Ducey Park) in 1995 and built Telus Field on the same spot. Ottawa had their AAA International League Lynx from 1993-2007. After the 1994 World Series was cancelled, and the Blue Jays began their inevitable slide, baseball interest across the country quickly began to waver. A slow death was upon us. 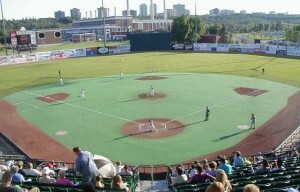 In 1999, British Columbia’s AAA club moved to Sacramento. Three years later, the Calgary Cannons became the Albuquerque Isotopes. Finally, in 2004, the Trappers left for Red Rock, Texas. Oh, there are still minor-league teams in these cities, and Winnipeg, but very few care. The calibre of ball is nothing like what it used to be. These teams did not move south because they were filling their stadia. Then, in the ultimate knee-to-the-groin for Canadian baseball fans, Les Expos shuffled off to Washington, D.C. in 2005, giving that God-forsaken city its THIRD try at Major League Baseball. Gimme a break. The Blue Jays play to mostly empty stadiums these days in Toronto. Jays’ 54-home run man Jose Bautista may well end up as the AL MVP. And nobody in Toronto cares. Joey Votto matured during Canada’s baseball heyday. He followed in the paths of Larry Walker (NL MVP, 1997) and Justin Morneau (AL MVP, 2006) as the best in baseball. But those days are gone now. Oh, there are still plenty of places and leagues for young Canadian men and women to play the game…but the country has been gutted of all its high-level clubs. What Canadian teams do today’s youth have to look up to? To draw encouragement from? To get excited about? In 2003, the Canadian Baseball League, with Fergie Jenkins as its commissioner, tried to start up. They didn’t even make it through one season. What will become of a young, would-be baseball player born in Canada today – when the game is going down faster than free beer at a frat party? Will he ever get the chance to become a league MVP? I sure hope so. But I’m not going to hold my breath.